Looking for fun ideas to play with a group of people? This list of fun games for adults to play will give you several great board games to play with friends! Corey and I are big board game people. I’ve shared some of our favorites before and these posts always seem to be a big hit (see all of my board game lists below! 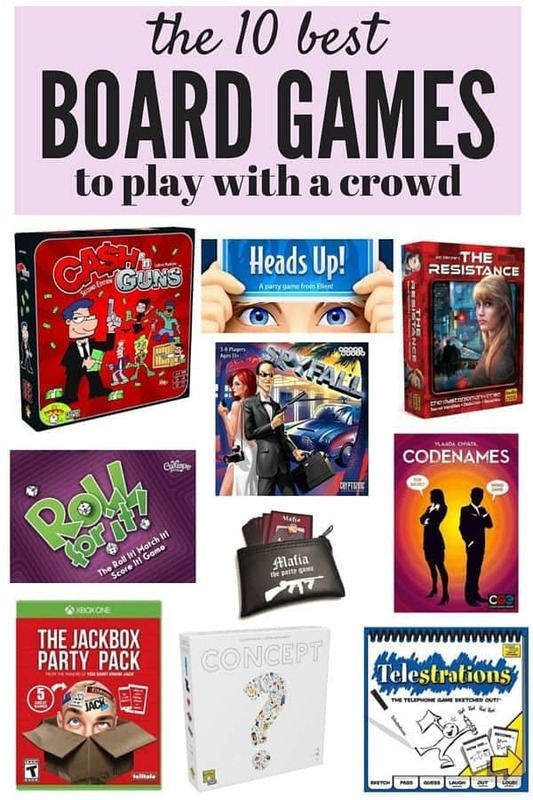 ), so I’m here today with another list of fun board games for adults to play – because board games shouldn’t just be for the kids! We love to have people over, and games are a fantastic way to spend the evening when you’re having a party. We’ve had lots of friends who were originally resistant to playing board games with us, but by the end of the night they’re usually asking when we can do it again! It’s taken us some time to gather a good collection of games that work well with a crowd, so here are our top 10 that we go to over and over! Concept (Up to 12 players) – This game is similar to Pictionary or Charades, but you’re using concepts on a board to try to communicate your message to your team. It’s a challenging game and it’s so fun to see how creative you can get in order to get your team to guess it! Some of these are pretty hard, but my 10-year old niece has successfully played with us many times, so it’s kid-friendly too! Spyfall (Up to 8 players) – This game is perfect for a party. Everyone at the table has a card that they have to keep secret – most of them have a location on them (the same location for every card) and one of them says “Spy”. Everyone asks one another questions, and the person who is the spy is trying to figure out where they’re at…while everyone else is trying to figure out who the spy is! It’s silly and a ton of fun. We always end up in fits of laughter when we play this one. Codenames (Up to 8 players) – This game is played in teams and one person on the team tries to get everyone else to guess the words assigned to that team by giving a one-word clue. It’s got a unique mechanic that makes it similar to Minefield in that all of the words are laid out on the table, and some belong to one team, some belong to the other, and one is like a little mine that automatically makes your team lose if your teammates guess it! Heads Up (No player limit) – I cannot even begin to tell you how hard we laugh every single time we play this game. We learned it from some of Corey’s One Act Play students when we had a gathering here, and we have been obsessed ever since. It can also be played on your phone (which makes it the ultimate portable game!) and is similar to Charades or Taboo. The person with the phone holds it up to their forehead with the screen facing out, and everyone else tries to get them to guess the word on the phone. Sometimes you can talk, sometimes you sing, and sometimes you just act it out. It’s hilarious, addicting, and so much fun! Roll For It (8 players with two sets) – This is a super simple game that’s great if you have kids around who want to play too. It’s technically only a four player game, but they make different colored versions so you can buy two and play with 8 (which is what we do!). In this game, you each have a set of dice that you roll to try to match a set of cards on the table. It’s incredibly fun for such a simple game, and we play this one often! Mafia (Up to 36 players) – I used to play this game with a plain ol’ deck of cards at every slumber party I went to as a kid. It is so much fun and it’s one of those games that just gets better the more people you have. This one is best played with a group who isn’t afraid to get a little silly! Another similar game that’s really popular is One Night Ultimate Werewolf. The Jackbox Party Pack (we also have the second version) (Player limit varies by game) – This is a collection of big party games that can be played on your XBox…another one we learned from the high school students! It has a variety of different games you can play, and they’re all fun. They all have very different rules, but the basic mechanics are the same for most of them – everyone has a prompt (sometimes to draw a picture, sometimes to answer a question, fill in the blanks, etc.) and then once everyone has answered all of the prompts, they’ll reveal them and everyone votes on their favorite. It can be pretty hilarious, and everyone can play using their phones, which makes it really accessible in a big crowd. Telestrations (Up to 8 players) – This game is a perfect mash-up of Pictionary and Telephone. One person starts with a prompt and has to draw a picture. They pass it to the next person, who writes down what they think it is. Then they pass it to the next person, who has to draw what the previous person wrote down…etc, etc. It’s pretty fun and it’s great for when your group includes kids! Cash ‘n Guns (Up to 8 players) – This game is always a giant hit when we bring it out. Everyone has a foam “gun” that they use to try to intimidate the rest of the group into letting them have the largest share of loot after a big heist. It’s a really unique game and it always has everyone laughing, shouting at one another, and being absolutely silly. The Resistance (Up to 10 players) – This is another “secret identity” game. One team is playing a group of resistance fighters and the other group is playing the government trying to shut them down. The resistance has to infiltrate the government by succeeding at a series of missions without being found out by the other team. It always takes people a round or two to catch onto, but we almost always have friends requesting to play this again immediately after we finish! These games all make very frequent appearances at our dining room table! We’ve tried our fair share of party games, but these are the ones we keep going back to over and over. What kinds of games do you like to play with a big group? We have most of those and I agree they’re so fun! I’ll have to get Nadia. I didn’t know there was a specific game for it! I love to play it with my kids at the end of the school year! (I have 8th graders). I’d recommend “we didn’t play test this at all” it’s a $10 card game on Amazon that can have up to 7 people I believe. Although we’ve played with 10. It’s a series of “rule” cards or random requests. It’s hard to explain but it’s SO silly and fun. I also really like Quelf for big groups but they have to be wiping to get silly. The last time I played I was in a homemade fort for 45 mins haha!